Summer School is a summer training programme of Evald Okas Museum, providing academic training for all adults interested in art. The initiator and coordinator of the programme is painting artist Mari Roosvalt. 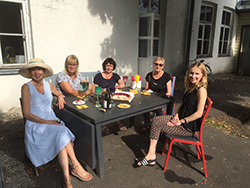 The mission of the Summer School is to bring people closer to art through professional training, to develop their skill to view art and appreciate beauty. 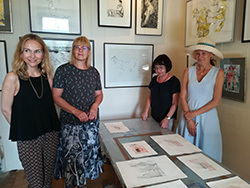 During the courses, the participants can acquire knowledge in painting, drawing, colour study, composition and graphic art under the instruction of recognized Estonian artists and teachers. In order to participate, register to a course by 29 June 2018 via e-mail eo.muuseum@gmail.com or by phone +372 5549024. Maximum size of a group is 12 persons, in the course of graphic art 10 persons. Courses of the Summer School are for a fee. Term of payment of the participation fee to the bank account of the museum is 29.06.2018. Bank account of the museum: EE832200221022264616, Swedbank. NB! In case of non-attendance at the courses the participation fee paid to the bank account of the museum will not be returned. The fee of Summer School does not include museum ticket. In order to visit the museum, the participants shall purchase the museum ticket. Monotype is a painting printed on paper or textile. It is the only print of a picture painted on the plate. Usually only a single good print is obtained, but depending on the means it is also possible to obtain more. If you have a glass plate for printing, you can put a suitable picture under it, and then paint through the glass. We also experiment with printing colour as graphic art technique. Sketches of a charming woman. The objective is to achieve immediate, spontaneous attitude. Speed means skill. 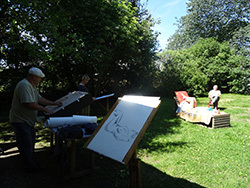 For three days the participants will learn to reproduce with limited means on paper the characteristic atmosphere of an old resort town: streets, courtyards, gardens etc. Charcoal, marker, ink, 2-3 colours and pencil will be used for drawing. The course will also develop the sense of perspective and the skill of spatial depiction of objects in a picture. 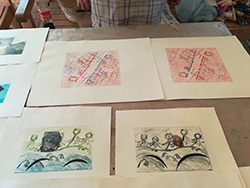 In two days the participants can make one or several graphic prints, as they want. For introduction we study relevant works of maestro Evald Okas. In our work, we use simple and more handy techniques of classical stamp graphics. On the first day a participant shall prepare one or several print plates. 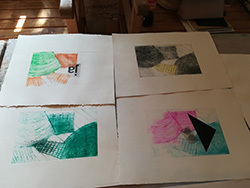 On the second day printing will take place, using special intaglio colours. The result may resemble a small aquarelle. Several (also multi-colour) prints can be made from one plate. At the end you will sign your picture and take it home. A graphic print is a suitable and valuable present!